Presenting an ornate Princess' Crown ornament with a heart-shaped center that is fit for the princess in your life. This royalty ornament contains large crystals throughout the crown's base and points making this ornament one that cannot be ignored! This crown ornament has a solid silver tone, a heavy metal backing, and is beautifully adorned with various sized pink crystal stones. The smaller stones are individually pronged into the rivets and not glued. This helps prevent breakage so you can enjoy this ornament for many years to come. Make sure you view our other royalty crown ornaments. Web pages copyright© 2003-2015 by DesignerOrnaments.com. All Rights Reserved. 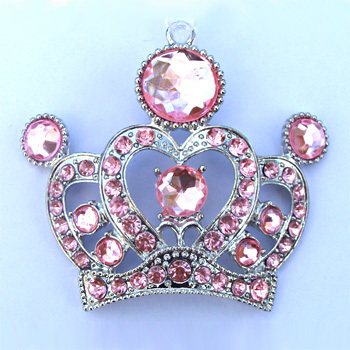 Princess Crown Christmas tree ornaments which depicts a crown of a princess made out heavy metal and adorned with various sized pink crystal stones can be purchased at Designer Ornaments.